Rockin' In The USA is now available to download for $30. Skype Consulting is also available to discuss your individual situation. We can set up a convenient time to talk one-on-one about your unique needs in real time. 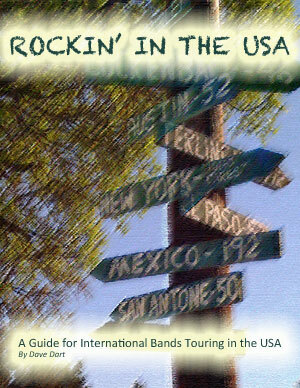 For a special price you can download the Rockin' In The USA Guide and schedule a Skype Consultation. It is very exciting to imagine a punk-style D.I.Y. tour where you slip into the country, play a bunch of smoky dive bars, sleep on floors, and come away with a great story. This is a great fantasy, but the reality is far different. Coming to the U.S.A. as a performing musician is a complex and expensive undertaking. A poorly planned tour is the opposite of the romantic fantasy - more often than not resulting in a giant step backward if not a complete end of the band. We work with artists from around the world to introduce their home countries and cultures to people in the United States through their music. Helping the artists get here is a very confusing, time-consuming, and expensive process. Over the past several years we have worked with bands from every inhabited continent and found solutions to the questions they face. Issues like immigration, tour planning, publicity, applying to festivals, making music business contacts, finding appropriate tour venues, and making a realistic budget are the common issues bands have to work out. As musicians from Australia we found Dart Music International to be invaluable to us as we began touring the US. We found the service that Dave provided incredible. From touring advice to setting up the right channels and helping us to secure our working visas to booking shows, not to mention his fantastic ideas, friendly and approachable manner and his hard work and dedication promoting international music the US. Dave gave us an inroad into the North American Market and delivered opportunities that I believe would not have been possible without DMI. I am often asked for advice from Australian Touring Musicians and I recommend reading DMI's consulting document and seeking advice from DMI to anyone travelling to the US for the first time with export plans for their music. DMI is truly an asset to the global music industry. Last modified on July 31st, 2013	by the Webmaster.